The National Palliative Care Registry™ is the central—and FREE to all—resource for national data on the operational features of palliative care programs in U.S. hospitals. 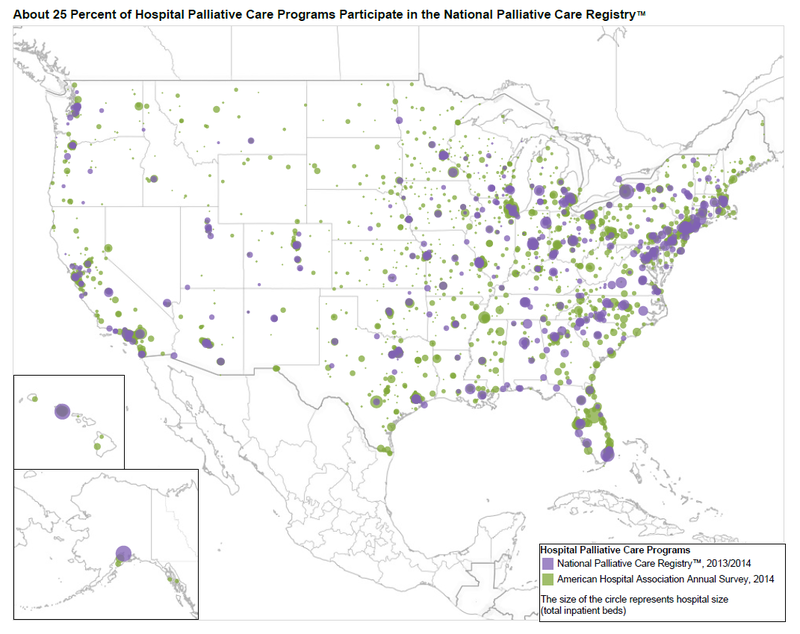 Since 2008, over 1,000 hospital palliative care programs have participated in the Registry. In the past 2 years, over 450 programs contributed data and received comparative reports—tracking their own program’s growth over time and comparing their own characteristics to those of peer programs across the nation. promote standardization and improve the quality of palliative care in the U.S. The Registry provides actionable data that programs can use to secure, expand and retain resources for delivery of high-quality palliative care, and to support the establishment of new palliative care programs where none exist. Hospitals that participate in the Registry represent every state (except Wyoming) and range from very small to some of the nation’s largest hospitals. Larger hospitals are somewhat more likely to participate in the Registry. Hospitals with 500 or more beds account for 23.9% of Registry participants, but represent only 10.9% of all hospitals with palliative care programs nationally. Smaller hospitals with 50-150 beds represent 12.7% of Registry participants but account for 26.8% of all hospitals reporting palliative care programs. The Registry is the only U.S. resource for tracking critical information about the operations and composition of palliative care teams in hospitals. 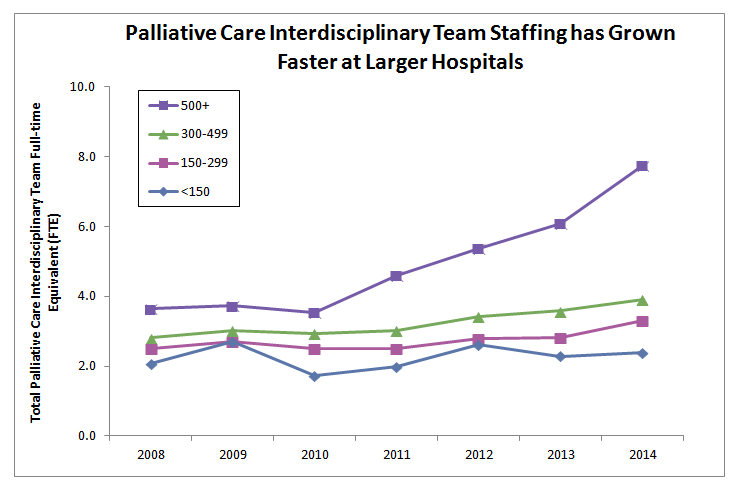 Data from participating hospitals in the Registry track the growth of palliative care over the past seven years. For example, in larger hospitals with 500 or more beds, the size of the interdisciplinary team has more than doubled from 3.6 full-time equivalent (FTE) staff in 2008 to 7.8 FTE in 2014. Albeit slower, similar growth in staffing is also occurring in smaller hospitals. Hospitals with 300-499 beds show a 40% increase from 2.8 FTE in 2008 to 3.9 in 2014; and hospitals with less than 150 beds report an increase of 14%, from 2.1 FTE in 2008 to 2.4 in 2014. Palliative Care specialty certification has also been increasing, particularly among Advanced Practice Registered Nurses (APRN). 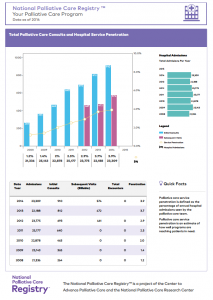 In 2008, just 33.2% of programs reported a certified APRN. This increased to 50.9% in 2014. By 2014, 75.7% of programs reported a board-certified palliative care physician as part of their team, and the average number of FTE certified physicians per team increased from 1.3 FTE in 2008 to 2.0 in 2014. The Registry includes two kinds of reports. 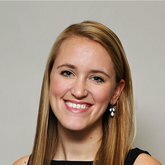 The first set of reports track a program’s development over time, and the second compares a program to peer programs on key metrics. Sample reports can be found here. Palliative care programs use these reports as self-assessment tools for internal quality improvement, and for reporting to administrators and boards of directors. Some programs use the reports to spark internal team discussions on priorities for improvement and investment. The data also help programs to set benchmarks and targets. For example, having national data on palliative care service penetration (the percentage of all hospital admissions served by the palliative care team) helps programs set their own goals. Comparative data also helps programs make the business case for palliative care to leadership. 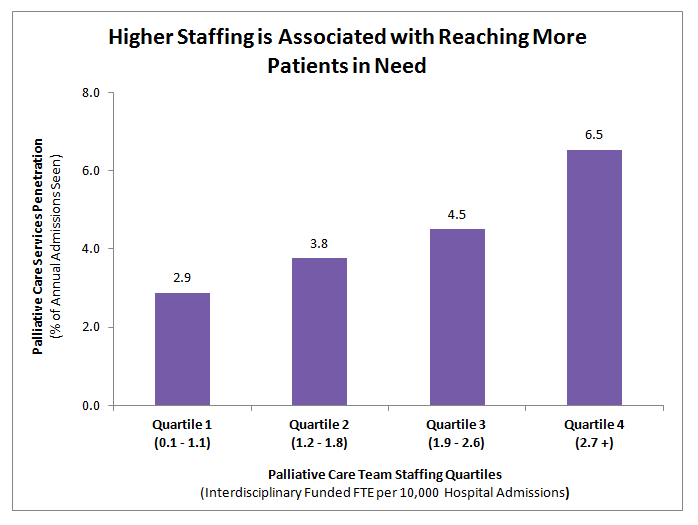 For example, a team at a 300 bed hospital was able to use their Registry data to show both significantly fewer funded team FTEs than similar sized peer hospitals– resulting in much lower service penetration or ability to reach patients in need of palliative care. These peer comparison data were key to convincing the C-Suite to approve funding for new hires for the palliative care team. After a year of investment and support from the Cambia Health Foundation and the Donaghue Foundation, the Registry has a far more user friendly and intuitive interface, allowing immediate report generation and an ability to submit, update, or correct data at any time. In March of this year, the Registry expanded to start collecting data on community palliative care programs. Programs can now enter data on one or more service settings including: hospital, outpatient clinic/office, long-term services and supports and home visits. 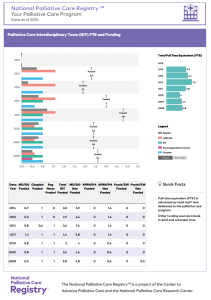 The first set of program-specific and summary reports will be available in the fall of 2016. Surveys will continue to expand and reports will be built out over the next two years, incorporating feedback from users. Since 2008, the National Palliative Care Registry™ has been a central resource for operational data about the palliative care programs in the nation’s hospitals. With our recent Registry redesign, this resource is now available to support the growth and quality of palliative care programs across the full continuum of care.